Glioblastoma is the most common of malign brain tumours in adults, and it currently has no cure. 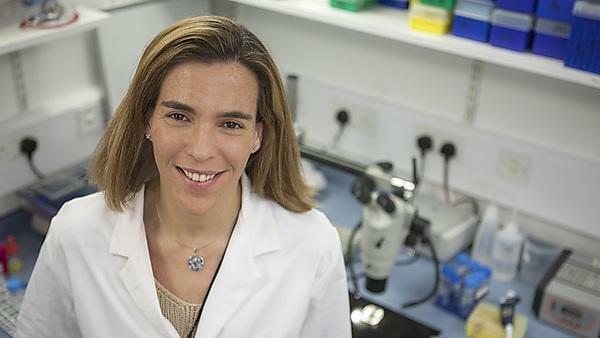 Now a research team led by Dr Claudia Barros, from the Plymouth University Peninsula Schools of Medicine and Dentistry and its Brain Tumour Research-funded Centre of Excellence, has secured funding from the Brain Research UK, which will help to expose novel molecules and their modes of action responsible for the initiation and growth of the disease. With the collaboration of colleagues from Derriford Hospital and the Medical Research Council Centre for Regenerative Medicine, Edinburgh, Dr Barros will investigate the cellular changes leading to the development of glioblastoma brain tumours – making vital steps in the bid to understand how they are formed and why they are prone to returning. Using a brain tumour model in Drosophila fruit flies – which were also used by the winners of this year’s Nobel Prize for Medicine – the researchers recapitulate hallmarks of human brain cancer stem cell and tumour development. In this model, Dr Barros’s team visualises cancer stem cells at the time they originate inside intact brain, and can identify early cellular and molecular changes. In this new project, the team is set to investigate comparable changes in cells from glioblastoma patients. Understanding the origin, driver mutations and properties of brain cancer stem cells is essential to the development of new and more effective treatments targeting these cells. Yet despite ongoing research efforts from teams around the world, Dr Barros explains, knowledge in this area is still limited. “We hope to contribute to a major current area in brain tumour research that underlies the questions of ‘How do brain tumours form, and why do they frequently re-appear after treatment?’” she said. “We are delighted to have been able to support this important work by Dr Barros. Neuro-oncology is one of our three priority research themes – reflecting a large unmet patient need coupled with insufficient current research investment. We want to improve the outlook for people with brain tumours by funding research that takes forward our understanding of the mechanisms underlying tumour development and helps develop better ways to diagnose and treat these tumours.